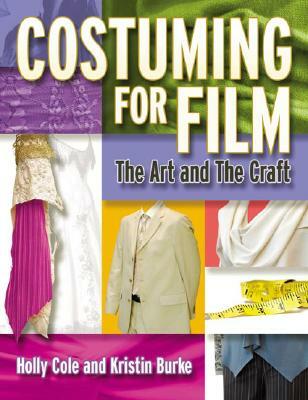 A college-level textbook on the ins and outs of designing costumes for films. Costuming for Film: The Art and the Craft is a massive (610 pages), illustrated guide that covers everything you need to know to get started and work successfully in film costuming. Costuming for Film covers such important artistic matters as telling a story through costumes, visual harmony and contrast, creating focus through colour, expressing emotion through line and shape and texture. Costuming for Film also covers such essential practical matters as looking for work, the roles played by various members of the costume/wardrobe department, union membership and regulations, delegation of duties on and off the set, working in collaboration with others, costume craftwork, script breakdown, writing and following budgets, organizing and running a production’s wardrobe department, designing for specific actors, fittings, dealing with deadlines, and much more. Holly Cole is an American Costume Designer and an associate professor of costume design at Ohio University. She has worked as a costume designer on feature films and television productions, Broadway productions, and regional theater productions. Her work was selected for exhibition at World Stage Design in Toronto in 2005. She runs the Young Designers Forum for the US Institute for Theater Technology and reviews portfolios for USITT, SETC, and the National Portfolio Review at Lincoln Center. Kristin Burke is an American Costume Designer. Educated at Northwestern University in Illinois, she was trained in the art of costume design by Virgil C. Johnson, an acclaimed designer for opera and the theatre. She has designed costumes for over forty feature films as well as music videos, commercials, and two television series. In addition to her work in film, she is an internationally-exhibited artist, specializing in collage and mail art.